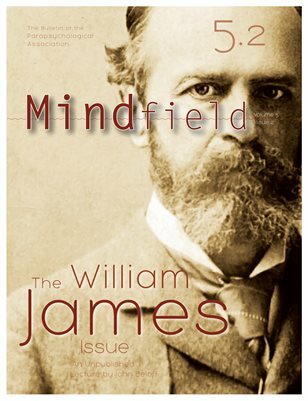 This is the William James Issue of Mindfield: the Bulletin of the Parapsychological Association. This issue brings you an unpublished lecture by John Beloff on William James delivered at a seminar on February 7, 1973, followed by a companion piece by Carlos Alvarado on William James and psychical research, with an exhaustive set of references. In addition, Richard Broughton, the PA's 2011 Outstanding Career Award winner provides his Reflections. PA President Alejandro Parra provides the final column of his term. Kaare Claudewitz introduces The Danish Journal of Psychical Research and Gerd Hövelmann provides the twelfth installment of his valuable reference list, Articles Relevant to Parapsychology in Journals of Various Fields.